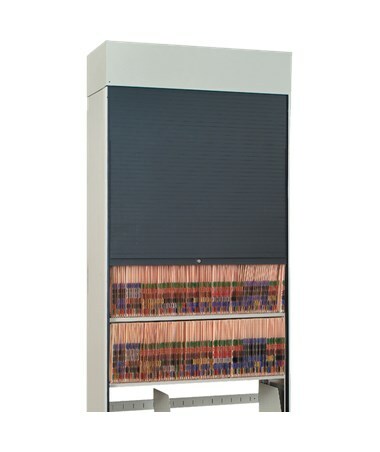 Secure, lockable HIPAA-compliant storage for medical records and other sensitive materials. Compatible with new or existing Datum ThinStak&amp;trade;, Vu-Stak&amp;trade;, and 4Post&amp;trade; systems. Comes in two colors: Charcoal Gray and Putty. Select Height 40" 57" 58" 59" 60" 61" 62" 63" 64"
Image shows Tambour Door in Charcoal Gray, attached to Datum 4Post™ Shelving cabinet (cabinet not included). Datum's TambourDoor™ system converts your new or existing unsecured file and shelving systems into secure, HIPAA-compliant storage for all letter, legal, and X-ray size records. The Tambour Door recesses into a housing unit installed on the top of the shelving cabinet. The door and housing unit are installed easily without disassembling the existing shelf. The unit is held securely with brackets and screws - not double-face tape like many other units. A spring-loaded mechanism along with a convenient handle at 32" makes for smooth and reliable opening and closing of the door. This door is made to last! Upright rails, door base, and door housing are made in the USA from durable cold-rolled steel, while the retractable door is made from wear-resistant extruded thermo-plastic. The TambourDoor™ is available in two colors: Charcoal Gray and Putty. Step 1: Determine the overall height and width of your cabinet. Round fractional values off - for example, if the height of your cabinet is 64-1/4", round the height value to 64". Note that the Tambour Door mounts to the top of the cabinet, increasing the overall height of the unit by 10 inches - be sure to factor in this height adjustment in your planning. Then select the desired height from the drop-dow list above. Step 2: Specify the color, either Charcoal Gray or Putty, and add this info to your order during checkout. Feel free to contact one of our friendly product experts for assistance with creating the Tambour Door filing solution uniquely tailored to your medical office's requirements. 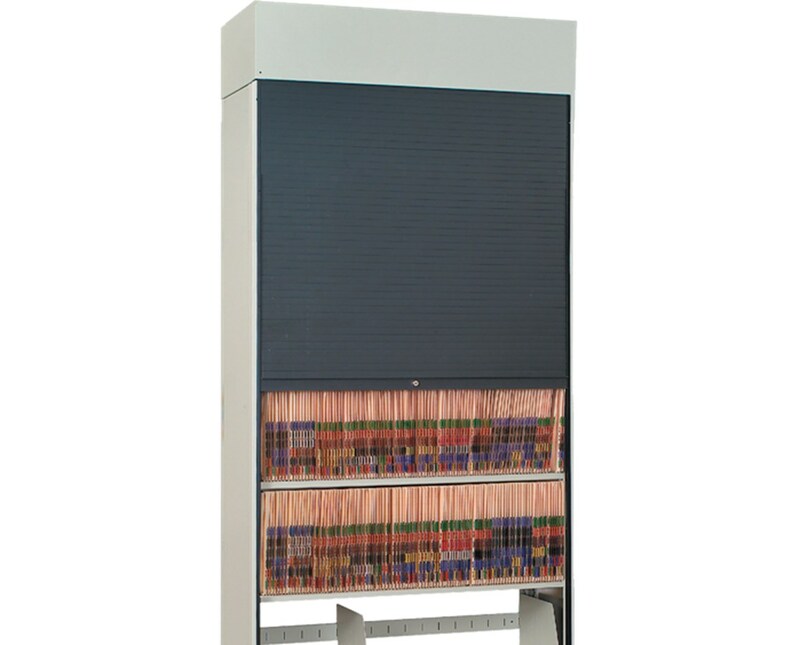 Lockable, HIPAA-compliant storage for medical records and other sensitive material. Uprights, door base, and door housing made from durable cold-rolled steel. Retractable door made from wear-resistant extruded thermo-plastic. Installs easily on new or existing Datum ThinStak™, Vu-Stak™, and 4Post™ systems. Spring-loaded mechanism for smooth open and close.